World Showdown of Esports (WSOE) #6: Serenity’s Destiny reached its finals day. The title holders, Team Serenity, now with a revamped roster and a TI winner on their side, will fight today in a best-of-five grand final to defend their golden necklaces. Serenity’s destiny will be challenged by either J.Storm, who reached the grand finals at the previous season as well, or by Infamous. The two teams will be pitted against each other today to decide which one goes to the grand finals. Four teams entered the battle this edition, but GGNGG and Team Juniper have both been eliminated on day one by Infamous. The South American team is now playing with Dominik “Black^” Reitmeier standing in the mid lane for Enzo “Timado” Gianoli and if they manage to take down J.Storm tonight, they can become the NA slayers in this event. Day two is promised to bring a few more surprises for the viewers. According to the organizers, a Dota Auto Chess match should be played, but no extra information was released. 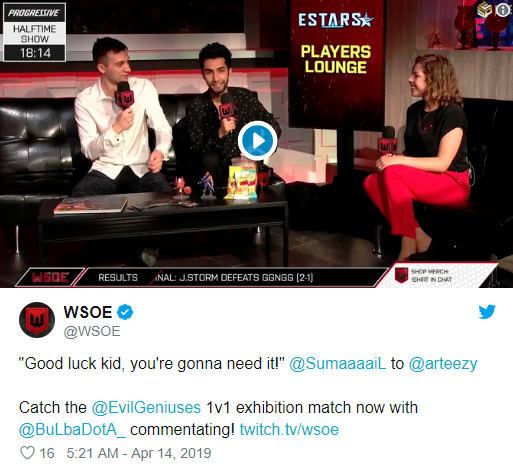 As part of the WSOE #6 extra content on day one, Artour “Arteezy” Babaev and Syed “SumaiL” Hassan who were Richard Lewis’ guests on the panel, took on a 1v1 challenge and despite sumaiL’s confidence, RTZ managed to take down his mid laner twice. The battle between the 2 EG cores followed the same simple rules of any 1v1 tournament: no jungle farming allowed, no creep blocking, no Bottle, no Soul Ring, no Infused Raindrop and no usage of the runes, shrines or Glyph of Fortification. Two kills or the tier one tower down were the winning conditions and the first match was a Pudge versus Pudge where Arteezy scored two kills on SumaiL. The second game was Axe versus Axe and again Arteezy stomped SumaiL to walk with a 2-0 victory over the one regarded as one of the best mid-laners in the world. Top 10 Anime Betrayals: DOTA Edition.